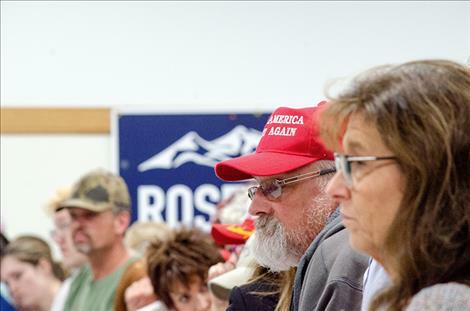 About 250 people attend a Republican-held rally at the Ronan Community Center on Saturday. The General Election will be held on Tuesday, Nov. 6. 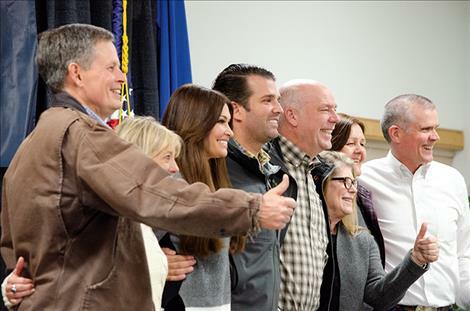 People on a Montana tour to support the Republican party smile for a few photos during the rally in Ronan, including, from left, Sen. Steve Daines and his wife,Cindy Daines; Kimberly Guilfoyle and Donald Trump Jr; U.S. Rep. Greg Gianforte and his wife, Susan Gianforte; and Jean Rosendale with her husband Senate candidate Matt Rosendale. RONAN – General elections usually don’t get as much buzz, but this year, the election has the potential to tip the Republican held majority in the United States Senate, possibly putting a new Speaker of the House on the podium if Demorcats take the majority. With so much on the line, big names on both sides are campaigning across the state to encourage people to get out and vote on Tuesday, Nov. 6. 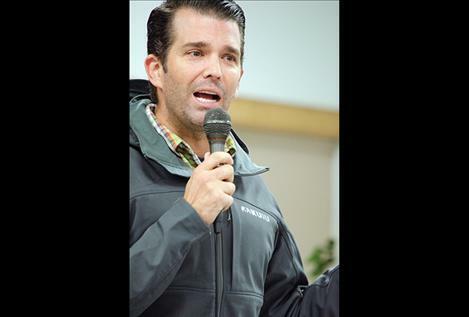 On Saturday, the Republican party brought a celebrity caravan to the Ronan Community Center including Donald Trump Jr. and his girlfriend, former Fox News co-host Kimberly Guilfoyle. 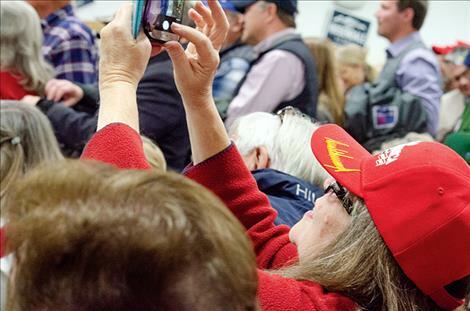 They traveled on a two-day bus tour across the state with Senate candidate Matt Rosendale and U.S. Rep. Greg Gianforte. 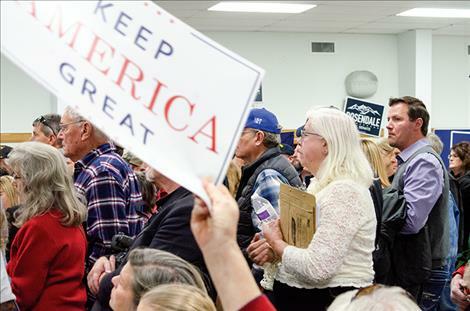 About 250 people packed into Ronan’s community center to hear a round of speeches concerning hunting rights, border issues, tax cuts and to support President Trump. 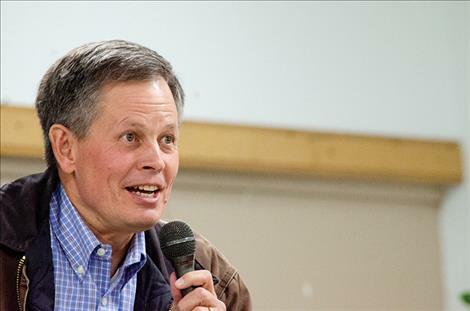 Sen. Steve Daines was at the event to support Rosendale and Gianforte. He said he was a proud gun owner and supporter of Supreme Court Justice Brett Kavanaugh. 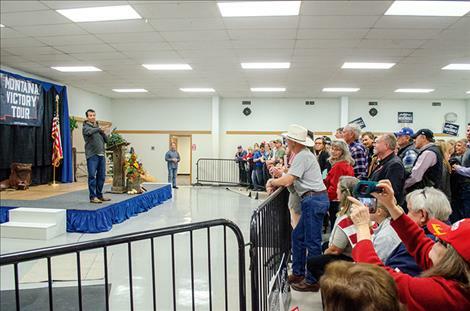 He spoke to the crowd and asked them to close their eyes and imagine Democrat Nancy Pelosi as the Speaker of the House. He said this was a “scary” thought. “If you look at what’s going on around the country, it will come down to election day as to whether Pelosi is Speaker of the House or not,” he said. He said the United States Senate has 51 Republican senators and 49 Democrats at this time. The majority of “yes” or “no” votes for policies that impact the country often go along party lines with few exceptions, which means the final outcome is often tied. “If you remember your civics class from high school, who breaks the tie in the United States Senate?” he asked the crowd. They gave him the answer saying it was the Vice President. He said Vice President Pence has broken nine ties since taking office. “You realize if he breaks one more tie that will be the most ties broken dating back to 1861,” he said. 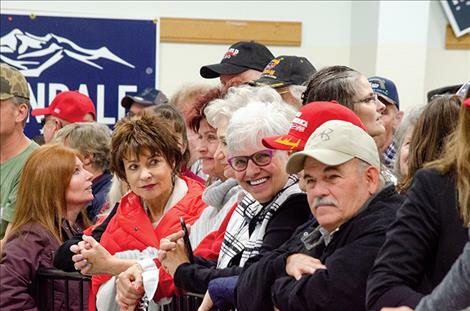 Daines said it was better to save Pence the trip and send Rosendale to join the Senate. 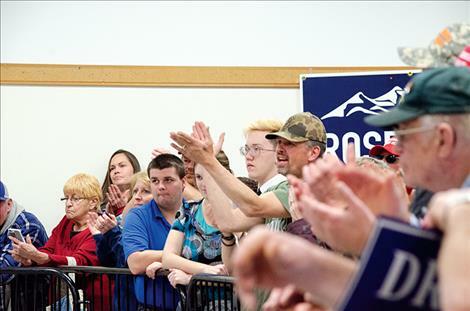 Rosendale was the next speaker saying “hello Ronan” to a crowd of cheering people. 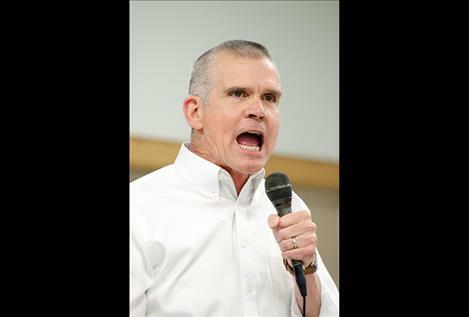 He is running against Democratic incumbent Jon Tester. 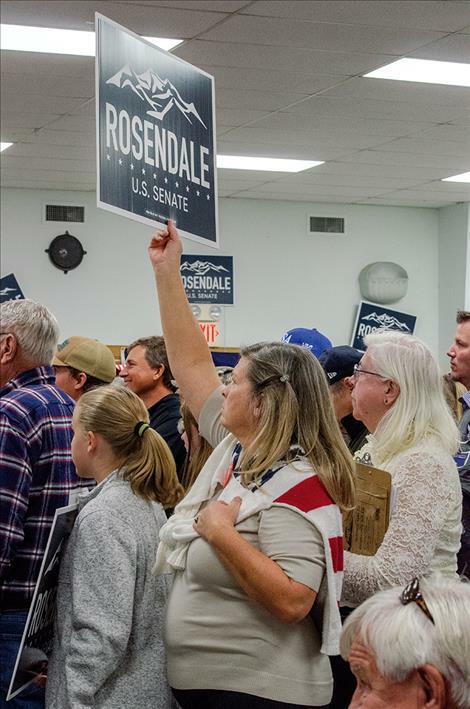 Rosendale asked the crowd if they were ready to send Senator Tester back to his home in Big Sandy, and instead, elect a senator that helps President Trump keep tax cuts in place, secure the southern border and build the wall. Congressman Greg Ginaforte spoke next about his support for President Trump, the economy, taking care of veteran’s healthcare programs, ending human trafficking, and building a wall on the southern border of the United States to keep out illegal immigrants and people dealing methamphetamines. 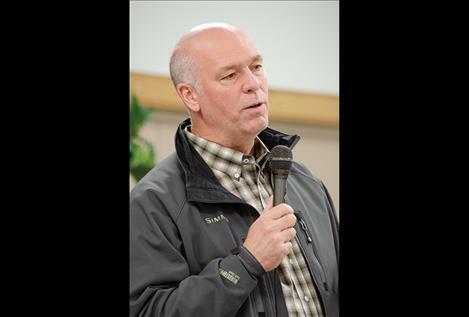 He said a Montana sheriff told him about “Mexican meth” coming into the United States from the southern border. “We don’t have Montana meth; we have Mexican meth coming into our communities,” he said. 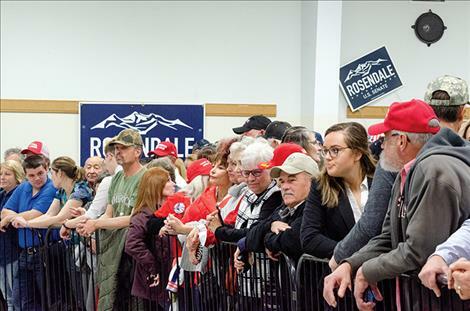 Guilfoyle took the microphone next to support Gianforte and Rosendale. She said she has known President Trump for 15 years and thinks he is a great man who has given a lot to this country. She also talked about the importance of voting so Pelosi doesn’t become Speaker of the House and call a vote to impeach President Trump. “I want you guys to deliver a red wave on election day,” she said. He said that while his father might not be on the ballot this year, his values and policies are at stake. He finished up by telling people to “get out and vote” before shaking hands and taking photos with people in the crowd. Karen and Don Cornelius were visiting family in St. Ignatius when they heard about the rally. 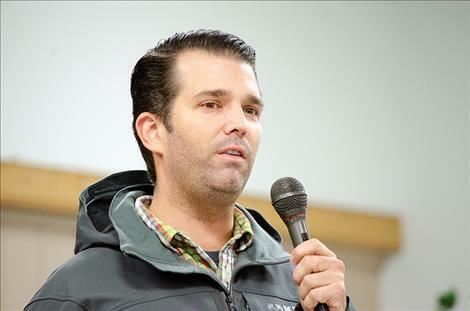 After listening to Trump Jr. speak, they had a few things to say. The General Election ballot includes three choices for United States Senator including Dem. 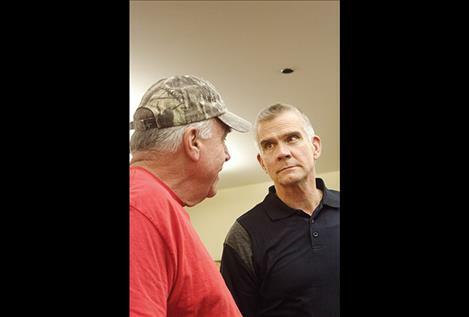 Jon Tester; Libertarian Rick Breckenridge; and Rep. Matt Rosendale. For United States Representative, there are three choices: Dem. Kathleen Williams; Rep. Greg Gianforte; and Libertarian Elinor Swanson. In District 5, the Public Service Commissioner candidates are Dem. Andy Shirtliff and Rep. Brad Johnson. The Clerk for the Supreme Court candidates are Libertarian Roger Roots; Rep. Bowen Greenwood; and Dem. Rex Renk. A “yes” or “no” vote needs to be cast for Montana Supreme Court Justice Beth Baker to retain the office for another term. Another “yes” or “no” vote is for Montana Supreme Court Judge Ingrid Gustafson to remain in office. The District Court Judge, District 20, nonpartisan choices are Ashley Morigeau and Deborah "Kim" Christopher. State representative choices for House District 93 are Dem. Eldena Bear Don’t Walk and Rep. Joe Read. The District 3 County Commissioner candidates are Dem. Caroline McDonald and Rep. Gale Decker. Dem. Paula Holle and is on the ballot for County Clerk and Recorder. Rep. Don Bell is the sheriff/ coroner candidate. Rep. Steven Eschenbaucher is on the ballot for Lake County Attorney. The County Superintendent of Schools candidate is Rep. Carolyn Hall. Rep. Robin G. Vert-Rubel is running for County Treasurer and Assessor. Another “yes” or “no” question is on the ballot asking if Lake County Justice Court Judge Randal Owens should remain in office. The ballot issues include Legislative Referendum No. 128 concerning the 6-Mill Levy for the Montana University System. Legislative Referendum LR-129 involves prohibiting a person from collecting another voter’s ballot. Initiative No. 185 raises taxes on tobacco products to generate revenue for health-related programs including Medicaid, veteran’s services, smoking prevention and long-term care services for seniors and people with disabilities. Initiative No. 186 requires the Department of Environmental Quality to deny a permit for any new hard-rock mines in Montana unless the reclamation plan provides evidence that the mine will not require perpetual treatment of water polluted by acid mine drainage or other contaminants. The K-12 St. Ignatius School District No. 28 bond election issue asks people to decide “yes” or “no” on a 20-year bond for the purpose of building an addition to the school to include a new gym, weight room, locker rooms, restrooms, shop, technology space, family and consumer sciences room and related improvements. For election questions, call the Lake County Election Office at 406-883-7268 or email kharding@lakemt.gov.